Sorry I've been a little absent from my blog again, I think I mentioned before that I've bagged myself a seasonal job as a Christmas elf so at the moment my life revolves around dressing in pointy hats with bells and nattering in a stupidly high voice, sigh. The life of an inspiring Actress, eh?! This outfit of the day look is all based on my fresh new kicks, thanks to the darl' of a boyfriend who bought me my first ever Stan Smiths for my Birthday. I'm now part of the clan! I thought I'd start getting these featured on my blog whilst they're all clean and shiny, knowing full well they're not going to last that white. My Stan Smiths have the pink tab on the back of the trainer and hints of a pink theme through out rather than all over, as I'm not too sure I'd be too keen on a pink trainer if it was all over the base (fussy eh?!). I then wore my blue Joni's from Topshop, a pair of jeans I haven't worn since tour as they're never an option over my black jeans usually, but thought I'd change things up a little. I've then put a black, crop, velvet shirt over the top of a basic striped tank top to create layering, which is so needed in this weather! The shirt is a beautiful piece from New Look and the basic stripe top is you're standard Primark. I then threw over my Topshop boyfriend coat, which I've had for a few years now but always bring out in the colder weather as it's such a standard piece in my wardrobe. 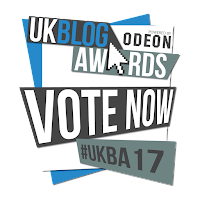 P.S- Please don't forget to vote for my in the UK Blog Awards 2017 as the deadline is Monday 19th December.. eeeekkk! Thank you for everyone who has voted so far, you beauties.